Marcella Mae Samsel, 100, of Cloverdale passed away on March 30th, 2019 at home. She was born on November 16th, 1918 in Cass County and was the daughter of the late Charles E. and Alva M. (Terrell) Pryor. She was married to James V. Samsel on August 4th, 1952, and he preceded her in death. Children surviving her are Patricia A. Johnson, Cloverdale, Michael L. Samsel (wife Barb), Lebanon, James E. Samsel (wife Becky), Cloverdale, Eddie Paul Samsel (Wife Cathy), Cloverdale, and one sister-in-law, Margaret Alice Wilson of California. She is also survived by 8 grandchildren, 8 great-grandchildren, and 2 great-great- grandchildren. 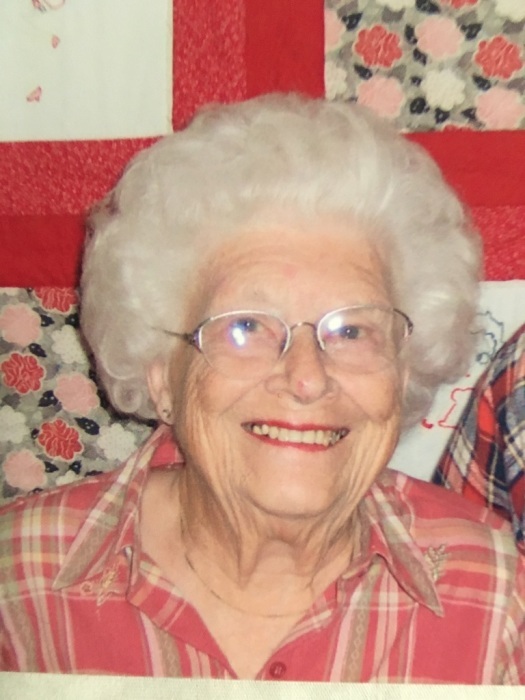 She was a member of the Putnamville United Methodist Church and the UMW Group, Allspice Extension Homemakers, Past County Extension Homemaker of the Year, Youth 4-H Leader and BSA Leader. She farmed alongside her husband raising cattle and row crops. Her bounty from her vast garden provided for her family of seven all year round. A great joy of hers was using her seamstress skills to dress her children and grandchildren and make beautiful hand pieced quilts for all members of the family while creating countless warm memories. She shared her quilting expertise by teaching classes and exhibiting at the county fair. In addition to her parents she was preceded in death by her son, Charles H. Samsel; granddaughter Kelly Ann Green; and sister, Donna Marie Brubaker. Funeral services for Marcella will be 1:00 pm April 4th, 2019 at Whitaker funeral home, with Pastor Tim Matthews officiating. Visitation will be from 4:00 pm to 8:00 pm April 3rd, 2019 at the funeral home.